With the growth of the WiFi connections, microwave ovens, cell phones and towers, toxic CFL and LED light bulbs, have come numerous complaints and even epidemiological studies indicating the low-level microwave radio-frequency (RF) radiations emitted by these devices are harmful to human health. Low level microwave radio frequenices (RF) are given off not only by various "wireless" internet, computer, and cell phone communication systems, but also by repeater stations placed on the roofs of apartment buildings (to eliminate "dark zones"), as well as from larger cellular telephone and microwave communications towers. The new classes of light bulbs, such as compact fluorescent CFLs and even LED bulbs, give off tremendous RF energies which, if scatted throughout your home, will subject you to a tremendous exposure. Obtaining good measurements of the radiations from these various devices and antennas has always posed a problem for those wanting to have exacting information on their exposure levels. Here are two YouTube videos showing the handy and economical EM2 RF meter in action. The new EM2 Multi-Purpose Electromagnetic Meter by Heliognosis-Canada helps to identify high exposures from ELF (extremely low frequency) Microwave and RF (radio frequency) sources. It is a highly sensitive, simple to use and economical meter, designed to measure both analog and digital electromagnetic signals across a very broad range. It will detect electromagnetic fields ranging from as low as 50 HZ (Hertz or cycles per second) up through and beyond 10-GHZ (giga-Hertz) for microwave ovens, Wi-Fi, radio broadcasting and cell phone communications, with a simple one-switch meter-dial display of field strength or intensity. * electrical power company "smart meters"
The EM2 meter can detect signal intensities as low as 0.005 uW/cm2 (micro-watts per square centimeter), up through 40 mW/cm2 (milli-watts). It's accuracy is +/- 10% from 50-HZ through 10-GHZ. The EM2 can also detect signals at higher frequenices above 10-GHZ, all the way up to 18-GHZ, though declining to about half-sensitivity at that high end of the range. The sensitive EM2 circuit detects the electric field component of the electromagnetic wave and converts it into a visually diplayed signal. Operation is simple - extend the antenna and power on the unit. After activating the power switch, the EM2 will begin displaying the measured electromagnetic field strength. Hold the unit in front of you while approaching potential sources of electromagnetic radiation.The readings will increase as you get closer to the source. Metal objects and buildings will block the radiation. You can use this property to help locate powerful sources located at a distance. If you pass in front of a building and the readings drop, it is likely that the source is behind the building. Take the meter around your home and neighborhood to survey local sources, held in the hand or placed on the dashboard of your car. 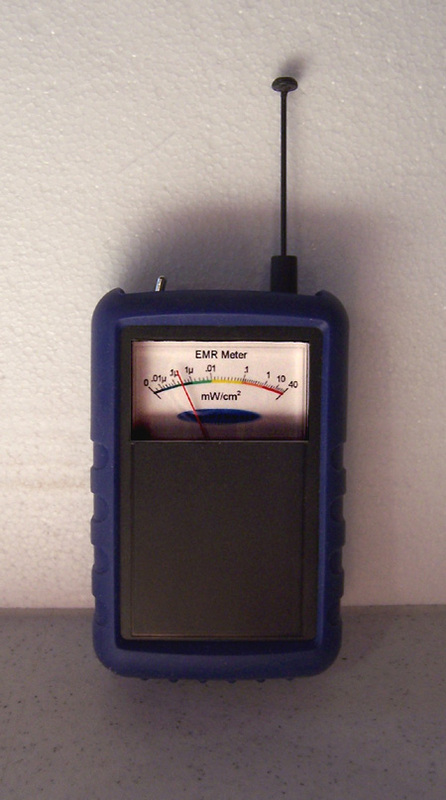 As an added feature, the EM2 can also detect powerline fields from either 60-cycle North American or 50-cycle European systems, but only the electrical field component -- it is primarily designed as an ELF and Microwave/RF meter, and will hence typically read lower for powerline fields as compared to most EMF meters detecting magnetic fields (such at the Trifield meter, which provides a readout in milligauss). Warranty: All our meters are warranted against defects of materials and workmanship, excluding abuse or misuse or breakage of parts by the purchaser, for a period of one year from the date of purchase. We will either repair or replace the meter with one of equal quality. Click here for our full Warranty and Returns Policy.